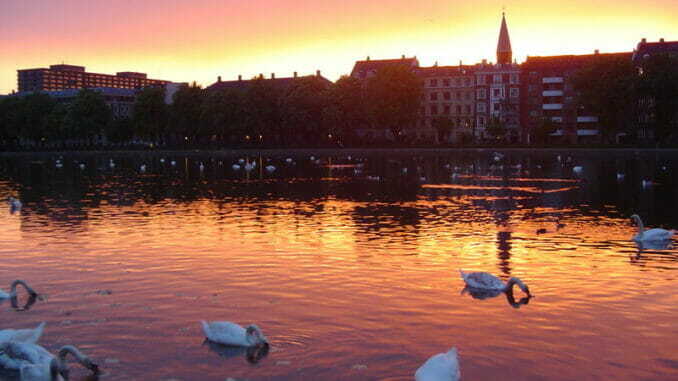 Situated around the northwest side of the city and stretching from the east to the west , “The Lakes” of Copenhagen is a popular recreational for many locals and count among the city’s natural jewels. They are made up of a row of three major lakes with five reservoirs or basins that divide them. The first is the Sankt Jorgens So (Saint George’s Lake) with two basins, one located to the south by the Tycho Brahe Planetarium and to the north at Gyldenlovesgade. It has a water depth of 4-5 meters. The second lake is Peblinge So (Student Lake) with a reservoir between Dronning Louises Bro and Gyldenlovesgade. The third is Sortedams So (Black Pond Lake) which is also divided by two basins to the north and south, the Dronning Louises Bro and the Osterbro, respectively. In Sortedams So they built two islands – the Fiskeoen (Fish Island) and the Fugleoen (Bird Island). The last two lakes have a water depth of about 2.5 meters. As well, there are four bridges that divide the lakes. The lakes were built in the 1500s with the original intention of improving the city’s fortifications and defense system. Later on, they became water reservoirs, connecting water from the bigger lakes and oceans and have since supplied fresh drinking water to the city until the 1950’s when the water was deemed unsafe to drink. Nowadays, the areas surrounding the lakes are used for many recreational activities such as walking or strolling, cycling, running and for lounging. In the winters, the lakes are also popular for ice skating.